Fall is nearly upon us! That means it's time to update your family portraits and send out cute holiday cards and letters. 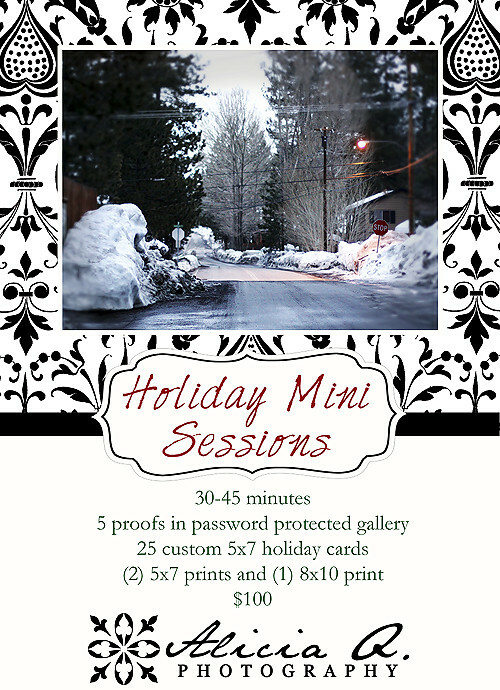 And Holiday Mini Sessions are here to help! These sessions are shorter than regular shoots, but come with a smaller price and lots of goodies! They're being offered between September 18th-30th. You pick your day and time, and I will provide the location (outdoor, within the Temecula Valley area). Send an email with your request! A $25 deposit will be required to hold your spot (balance due at time of session). Remember to keep checking back or Fan us on Facebook for upcoming specials!